It was actually Chevy Chase. Pryor was interviewing for a job and he and interviewer (Chase) were doing Word Association. I was trying to find a clip, but could only find transcripts. Of course it's not half as funny reading it as seeing them act it out. The exchange was between a Job Personnel Interviewer and a potential Job Applicant. 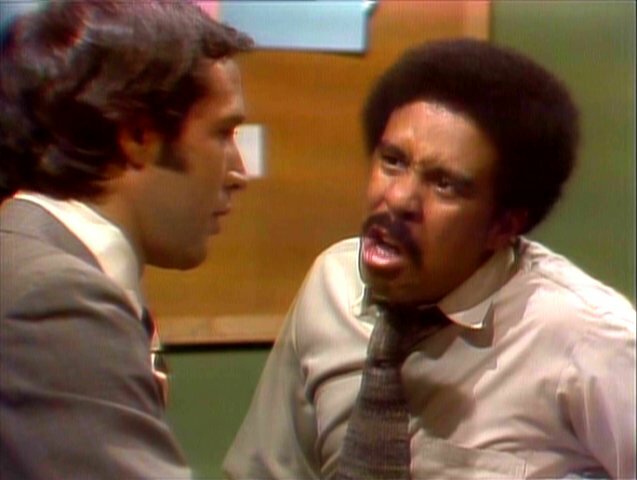 Chevy Chase & Richard Pryor. The word association skit was to gage the applicants response to certain slang terminology. here is also a link to the scipted text. Not sure if it's available in your area, but here is the clip from the 1975 word association clip. But I got something even better than that. Brings back a wonderful childhood memory. When it would come on, we would all take our places. Dad would sit at the piano acting like he was playing and all (five of us) singing and laughing. Well that would be Archie and Edith Bunker at the piano singing. Another one of those interesting soaps born from the Counter-Culture Protester Club era. Now the Meat-Head (Big Rob) is using Tobacco Tax money in California to teach parents how to raise their kids to it's Kalifornia citizenry. Why can't we all just get along? God almighty, I am so sick, sore and tired of all this racial slur talk, name calling, bullying and all the rest of the bad stuff that people do to each other. We are in such a crucial time in our economy with people losing homes, living in tents, losing jobs...why do we have to get into these wretched debates over what the frig color someones skin is and what NAMES we call each other?? It all is so unimportant and petty now. Don't get ya drawers all in a bunch dere, Connecticut Pam. Hmmm, well, I'm sure there was just as much nonsense then as there is now. Just a diversion. We'll all get back to saving the world right after that next post... I'm sure we will, right? Of course we will... we'll get right on that. 30 Rock on thursday an african american character calls a white character a "cracker". Anyone offended by this? What if it was a derogatory remark against another group would NBC let this fly? sad but true, if a slur is made against whites, no one will care, but be it agaisnt anyone else...look out!!!! im a mutt, seriously, im german, irish, native american and gosh knows what....thanks to the indian in my family...ooopsss..american indian, we tan easy, my hubby calls my his little dirty foot all the time, because of heritage and fact i like to go barefoot, do i care? no. thats my point, now days its all for the birds, racisim is only racism as long as we keep it going. will it ever end? i wonder. we can call someone a jerk, a creep, any number of names, if we are mad or dont like someone, but if that someone is differant color, then everyone gets mad, if your being a jerk for example, nomatter what color you are, i will call you a jerk if its warrented, but dont come back and reply with "oh, im this color and you called me a jerk...your a racisit" cuz thats stupid. if blacks dont want to be called stuff, then tit4tat...dont call whites stupid names either, same goes for all races....duh. and another thing, if you can call your own race something like the "N" word, then why take offence when someone non black says it? i dont know....i think if all we just get off the racist track nd start realizing we are AMERICANS, then things will start to get simplier.